Inside the metal tube, a heater coil is embedded and electrically isolated in highly compressed magnesium oxide. The optimised structure and very high density of the magnesium oxide form the basis for the excellent mechanical and thermal characteristics of the E.G.O tubular heating elements. They can also be fitted with thermostats and temperature limiters in most applications. The determining factors when dimensioning tubular heating elements are the specific loads and the temperature limits of the heated material, the tube shell and the heating conductor. If the heating element is accurately dimensioned, it will operate reliably and over a long period. This also requires the element to be installed correctly and have an adequate outflow of heat. The temperature limits of the medium and, if liquids are heated, suitable protection against boiling dry should also be considered. DIN 44875 also includes recommended specific surface loads. Note: For advise on your application and element design, please contact our office were we will be pleased to assist you. To enable us to work out a proposal and a detailed quotation for your heating element requirements, we need various data. 2. 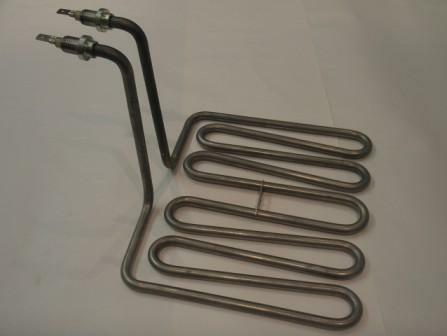 Dimensions of tubular heating element and space available for mounting, length of unheated tube ends.